For active travellers looking for a waterside adventure, La Plaine Tonique's luxury camping site is a perfect choice. Set on a lake, visitors at La Plaine Tonique can expect an action packed vacation with all the benefits of a typical poolside holiday. 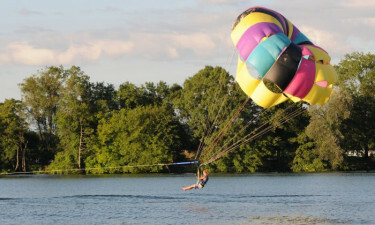 With a host of activities, La Plaine Tonique is a popularchoice. La Plaine Tonique is one of the most exciting campsites in France. It is set on a lake which offers many leisure and sailing opportunities within a short walking distance from your mobile home. If you'd prefer something more wild, the famous Jura mountains 100 km away. 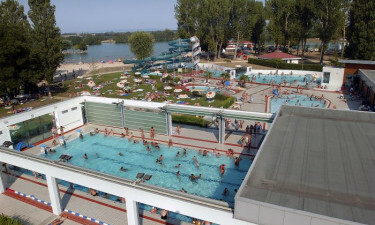 If you are looking for an exhilarating camping holiday, book La Plaine Tonique with LuxCamp. Why choose La Plaine Tonique? You can swim lengths in one of several pools, including a large 560m² heated pool. Several slides and activities are also available for children (or kids at heart), including a paddling pool for little ones. Hydro massages, fountains, pool classes and saunas are also available for ultimate relaxation. Although there is no seaside in sight, the 95 hectare lake has two sand beaches and several wild islands for exploring. 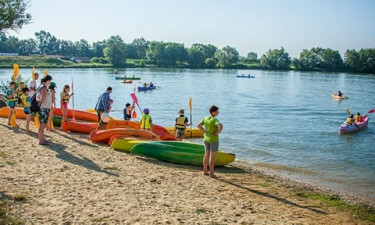 You are welcome to take a dip in the cooling lake water, build sandcastles or sunbathe beside on the beach, but the lake has much, much more - including water skiing and banana boats.